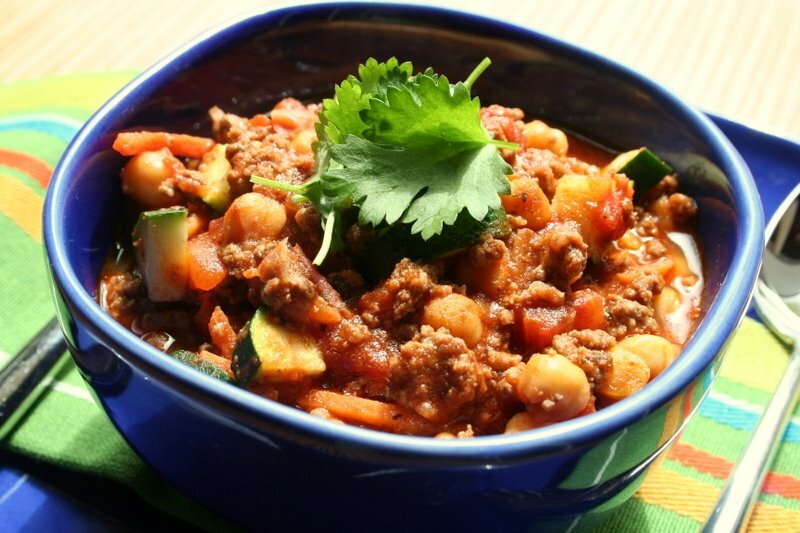 A perfect example of how to transform a traditional meat sauce into a double healthy option. The sauce contains 5 vegetables plus 2 kinds of legumes to boost the fibre and protein. Serve with favourite cooked brown or basmati rice, couscous, boiled jacket potatoes or crusty bread and green salad. Heat the olive oil in a heavy based saucepan and add the vegetables, chilli powder, cumin and cinnamon. Cook and stir over moderate heat for 5 minutes. Add the meat, stir to break up finely and continue cooking for 3 minutes more. Add the chickpeas, kidney beans, tomatoes, water, vinegar, salt and a good grinding of pepper and bring to the boil. Turn down the heat and simmer partly covered for about an hour, stirring from time to time to stop it catching. Add a little more water if needed. Place the yoghurt and avocado into small serving bowls. Adjust seasoning and serve the meat with side dishes as explained above. The chickpeas or the beans can be replaced by 1 cup (250 ml) finely diced potato. 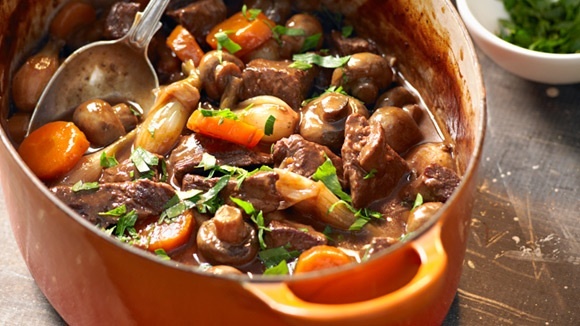 The unequalled classic, rich beef stew is known as “Boeuf Bourguignonne” means “beef in burgundy” or good red wine. The dish originates from the Burgundy region in France. The amount of wine added may be adjusted or even omitted to suit personal preference. The success of the dish depends on the quality of the meat and correct cooking methods. Trim any surplus fat from the meat and cut into neat 2 cm cubes. Heat the butter and oil in a heavy-based saucepan and add one third of the meat at a time. Brown over moderate heat, stirring from time to time, and place in an oven-roasting pot. Repeat with the remaining meat. At the same time, place the bacon in a 2nd saucepan and fry gently until crisp. Remove the bacon, add the meat, onions and mushrooms and cook gently, stirring from time to time until the onions are light golden and set aside. Add the extra butter to the saucepan in which the meat was browned and add the garlic. Cook gently, stirring for 1 minute, then add the flour and stir until golden brown. Stir in the wine, water beef stock powder, and sugar and stir continuously until smooth and thickened. Pour the sauce over the meat and bacon, cover and oven-braise 40 minutes at 160 °C until the meat is almost tender. Add the onions, mushrooms, salt and black pepper to taste. Stir to combine, cover and oven-braise for a further 20 minutes or until tender. Sprinkle generously with the parsley and serve piping hot with rice and vegetables. Recipe from Carolié de Koster’s Art Of Cooking, p. 235. This dish is a Milanese specialty of cross-cut veal shanks braised with vegetables, white wine and broth. It is often garnished with gremolata and traditionally served with polenta or mashed potato. When loosely translated from Italian, Ossobucco means hollowed bone – a reference to the large piece of marrow in the center of the veal shank bone. Dust each shank with flour, salt and pepper. In a large oven proof pan, melt the butter with the oil, and brown the shanks well on both sides. Remove to a separate plate and pour off any fat. Rehydrate the porcini mushrooms in a cup of warm water for 30 minutes. Drain, retaining the mushroom liquid, and finely chop the mushrooms and set aside. Strain the mushroom liquid through a fine sieve, and measure out 1/2 cup, then set aside. Add the vegetables to the pan, and sauté the vegetables until tender. Add the wine, scrape up any brown bits on the bottom, bring to a boil and reduce. Add the beef broth and mushroom liquid and heat. Return the shanks to the pan, cover and place in the oven for at least 2 hours, or until the meat begins to fall off the bones. Combine the ingredients for the gremolata topping and set it aside. To make the polenta, bring 750 ml cold water to the boil in a saucepan. Add the polenta in a thin, steady stream, whisking constantly. Reduce the heat to low and cook, while stirring, for 5 minutes or until the polenta is soft. Remove the polenta from heat and stir in the cream. Season with salt and pepper and spoon into individual plates. Serve one shank per person and spoon some of the sauce over the shank and polenta. Sprinkle with the gremolata topping and serve. If the sauce is not thick, carefully remove the veal shanks to a warm dish and return the pan to the stove top over high heat. Cook until the sauce has thickened. Just before serving, return the veal shanks to the pan to reheat. Gremolata is an Italian garnish made from finely minced parsley, garlic and lemon zest. It is traditionally served with veal but it is also an excellent accompaniment for fish and seafood dishes. A party dish that requires minimum effort and needs only boiled rice or buttered couscous, salad and a bottle of chilled Rosé or white wine as accompaniments. 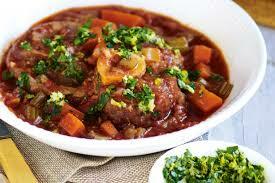 Note: Use the boneless meat for an elegant dinner party or the meat on the bone for a country-style stew. Melt about 1/3 of the butter or margarine in a saucepan and lightly brown 1/3 of the meat. Remove the browned meat and repeat twice more until all the meat has been browned and removed from the saucepan. Set the meat aside. Add the spring onion and leek or onion to the same saucepan and cook while stirring until softened. Return the meat together with the stock or boiling water and stock powder, whole mushrooms, coriander, cloves, lemon juice and green beans. Bring to boil while stirring, reduce heat, cover and simmer gently for about 1 hour or until the meat is completely tender. Mix the cake flour with a little water, stir into the mixture and simmer a few minutes. Beat together egg, egg yolk and cream and stir in a few spoons of the hot mixture. Stir into casserole and heat through while stirring until the sauce thickens. Serve piping hot or allow to cool and reheat gently when required – do not boil for any length of time. The success of these luxury rolls depends on the neatness of the veal escalopes. Have the meat sliced uniformly by a good butcher instead of purchasing pre-packed uneven slices. The rich, crisp crumbed meat is complimented excellently by the freshness of the cucumber. Flatten the escalopes with a mallet until quite thin and cover each with a slice of ham. Combine the cheese and spring onion and divide between the slices. Shape the cheese with the fingers to form log-shaped rolls crosswise over the centre portion of each slice. Roll the meat and ham over the cheese, starting from one of the shorter sides and roll up firmly into a neat roll. Secure each roll with 1 – 2 cocktail sticks as needed. Season the flour with salt and coat the rolls with flour. Beat one egg lightly and dip each roll into the egg and then into crumbs, to coat evenly. If necessary use the second egg as well. Refrigerate the rolls until ready to fry. Prepare the creamed cucumber in the meantime. Combine the butter or margarine and onion in a saucepan and saute‚ 3 minutes. Peel the cucumber, dice finely and add to the saucepan. Saute‚ 3 minutes and stir in the flour, sour cream, nutmeg, salt and pepper and simmer 10 minutes. Pour sufficient oil into a heavy saucepan to make it about 50 mm full and heat until moderately hot (170 ºC). Fry the crumbed rolls about 3 minutes on a side until crisp and golden. Drain on absorbent paper and arrange neatly onto a serving platter. Spoon the hot creamed cucumber around the rolls, sprinkle lightly with black pepper and garnish with a few sprigs of parsley just before serving. Mashed potato and a mixed salad make good accompaniments. Tender meat, crisp crumbs, creamy cheese and a tasty sauce – nothing could be better! The dish may be completed a few hours in advance and baked just before serving. Carry out the frying of the schnitzels meticulously to obtain neatly-fried and evenly-browned schnitzels. Place the seasoned flour in one shallow dish or soup plate, the beaten egg, water and oil in a second and the crumbs in a third. Coat the schnitzel generously with flour and shake off the excess. Dip into the beaten egg mixture and then press into the crumbs to coat all over. Place on a platter and refrigerate to set the crumbs for at least 30 minutes or until required. Heat half of the butter and half of the oil in a shallow heavy-based saucepan until moderately hot and fry the schnitzels on one side only until golden and crisp. Remove from the pan, wipe out the excess crumbs with a paper towel and add the remaining butter and oil. Fry the second side on the same manner and place the schnitzels on a large ovenproof platter. Add the garlic and herb seasoning and herbs to the tomato mixture and slice the mozzarella thinly. Place a thin slice of cheese onto each schnitzel, cover with a spoonful of the tomato mixture and the remaining cheese. Cover and keep refrigerated until 30 minutes before serving. Preheat the oven to 200 °C and bake the schnitzels with the topping for about 15 minutes or until the topping is bubbly. Serve immediately as they are or sprinkle with a little parmesan cheese and garnish with sprigs of parsley. If you prefer, you can use chicken breasts. You will need to flatten them to a thickness of 3 mm with a rolling pin.